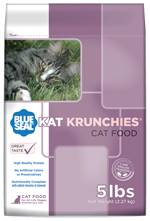 A great tasting dry cat food, Blue Seal’s Kat Krunchies® all life stages formula provides cats with wholesome nutrition needed to promote long, healthy, active lives. Kat Krunchies offers high-quality protein as its primary ingredient to help fuel the development and repair of muscles and organs. Taurine, a vital essential amino acid, is also added to promote retinal and cardiac health, all of which leads to healthy feline friends. 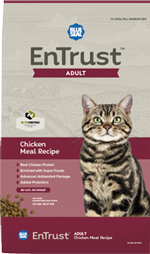 High-quality protein for a taste cats love. 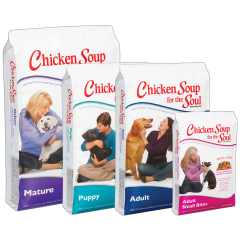 Naturally preserved with no artificial colors or flavors. 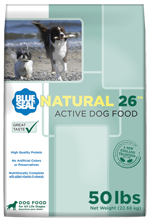 Nutritionally complete with added vitamins and minerals. Taurine promotes retinal and cardiac health. Yeast culture aids in nutrient utilization.